Huawei has released the smart phones, Honor 3C along with the stunning and unique specs as it is added with the 5” LPTS screen and has the 720p resolution. This handset is also added with the quad core Cortex A7 and the MediaTek MT6582, RAM of 2 GB and runs on the 4.2 Android. This handset is marketed with the double camera as the front facing camera has the specs of 5 MP, which is meant for the video calling and the other is 8 MP on the rear side to make the quality pictures with it. The newly released handset, Honor 3C is equipped with the dual SIM slot and it got the support the world over. This handset is provided with the RAM of 1 GB and 2 GB separately. The internal storage capacity of the smart phone is 8 GB, which is extensive and you can also add the microSD card in these two slots. 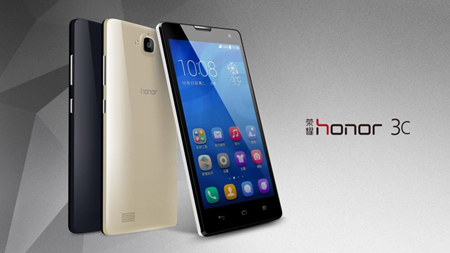 The customers can get the smart phone, Honor 3C for CNY 800 ($130) and it is also provided on the CNY 1000 ($160). You can get these smart phones, in the dual versions of 1 GB and 2 GB and these are available on the relevant websites.